It’s not often my mouth waters when I’m writing up a post but I could eat all four servings of this dish right now! 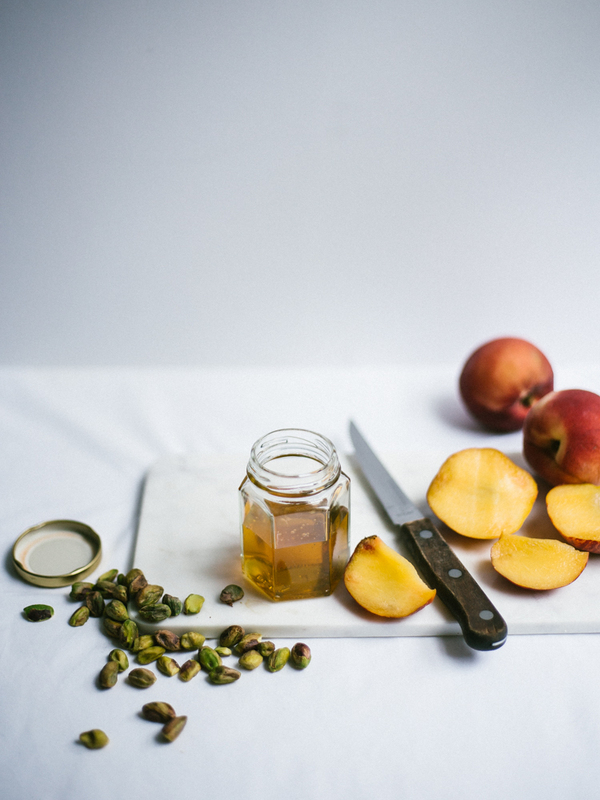 Honey baked peaches are something I look forward to every year and adding the mascarpone along with pistachios has become my favourite way to eat them. 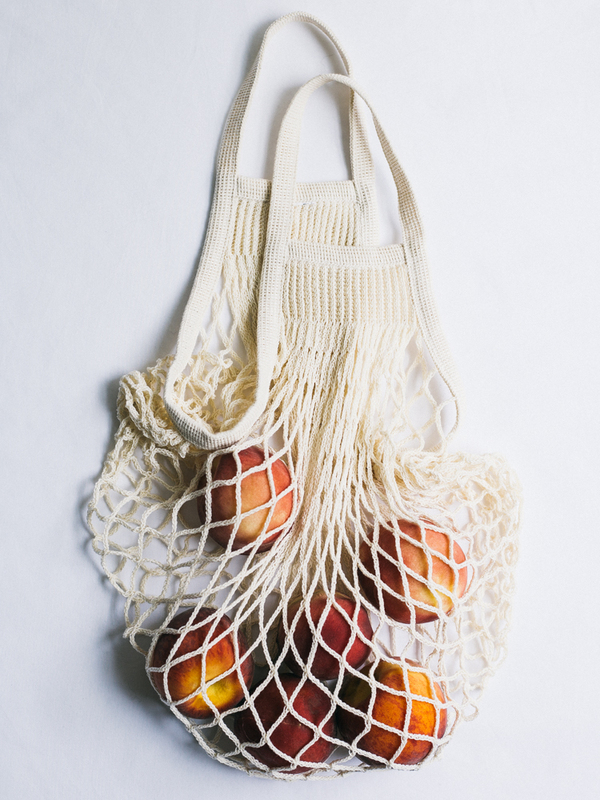 While peaches obviously aren’t a British seasonal star, summertime is when they are at their best wherever you do buy them from. Lookout for the doughnut peaches too! Also known as the Saturn variety, those are the peaches with a whiter flesh that look like they’ve been squashed down flat to the size of a doughnut. I’ve just used good old regular peaches here but I’m sure the flat ones would work equally as well. As always, buy the best the produce you can find. It’s in simple cooking like this you really, really notice the difference. Sweet treats, or desserts of any kind really, don’t frequent the blog too much. I’m just much more of a savoury girl. I might go out on a limb here and say that if I had to choose one sweet dish to eat for the rest of my days, this would be the one. 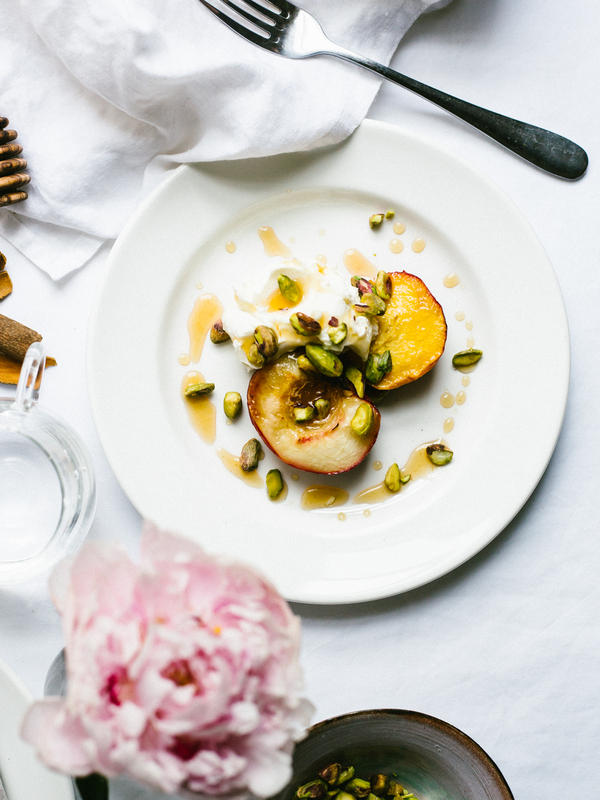 The peaches hot out of the oven with the sweet sweet honey and the mascarpone just melts over the top of them with the final crunch from pistachio nuts – DIVINE! I’ve not said much but I honestly feel like I need to stop writing about them already because this is killing me… Time to wrap up now before I drool over the keyboard. Before I do, I’ll also mention that this is my seasonal recipe of the month which I’m also contributing over on Abi’s blog These Four Walls, do have a potter around over there for lifestyle and travel inspiration aplenty. Now don’t mind me, I’m off to the shops with a list that coincidentally looks an awful lot like the ingredients below! Preheat the oven to gas mark 4/180 °C/160 °C (fan). Grease an oven proof baking dish with the butter and nestle the peaches into the dish, flesh side up. Drizzle the honey over the peaches and add the cinnamon sticks. Bake in the hot oven for 15 minutes, remove and spoon over the honey from the baking dish. Bake for a further 15 minutes until golden. Serve with a generous scoop of mascarpone, drizzle of honey from the dish and some chopped pistachios.